Over the next week, the party manifestos are going to be published (or in Labour’s case the second, agreed draft will be published). We are going to see what policies they are fighting the election on. In the case of the Conservatives, their manifesto will be the programme by which we are to be governed for the next five years, so we sure as hell better read it properly. Meanwhile, Labour’s manifesto, if it bears resemblance to the one leaked on Wednesday, will perform a different function. It will, and I find this refreshing, make us discuss policies that we haven’t properly discussed for a long time. When Jeremy Corbyn was elected, I suggested that his leadership would get issues debated that hadn’t been debated before, and should have been (hello, nuclear weapons), and issues debated that hadn’t been debated for a long time. The draft manifesto looks like that is so. Jeremy Corbyn may well have moved the Overton Window. 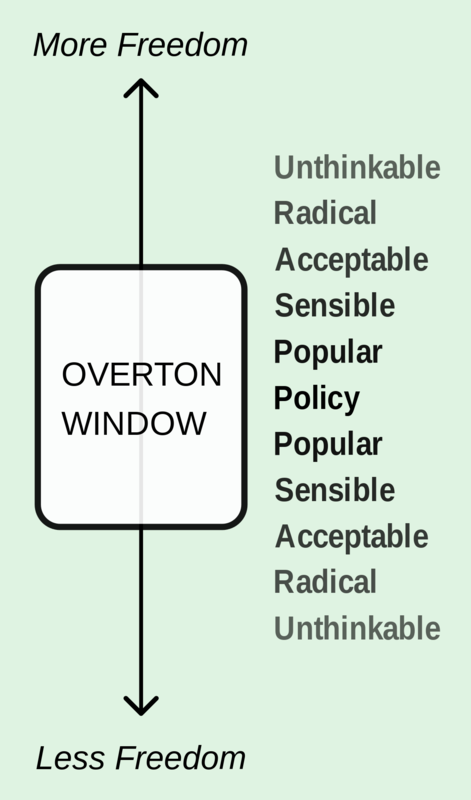 The Overton Window derives its name from Joseph P. Overton, a former vice president of the Mackinac Center for Public Policy in the USA. Overton suggested that the way to ascertain a policy’s viability is if it falls within the window of discourse. This includes the range of policies considered politically acceptable in the current climate of public opinion, which a politician can recommend without being considered too extreme to gain or keep public office. Overton suggested you could put these ideas on a spectrum – which he suggested was from “more freedom” to “less freedom”, in order to not make people think it was about ‘left and right’. Political commentator Joshua Trevino then came up with some degrees of acceptance, which are, roughly – Unthinkable, Radical, Acceptable, Sensible, Popular, Policy. Overton argued that his window could be used to identify which ideas define the domain of acceptability within a democracy’s possible governmental policies. Proponents of policies outside the window would seek to educate and persuade the public that the window should be moved or expanded, whilst proponents of current policies seek to persuade people that those new policies should be kept unacceptable. So what is Jeremy Corbyn’s role in all this? Well, because of Jeremy Corbyn we have had debates, real debates about whether or not we should renew Trident or whether or not we should set an example by unilaterally disarming. Even a debate of this was not in the Overton window before Corbyn. Now, in this upcoming election, policies that haven’t been properly debated for a long time are going to have to be debated. Policies to do with the role of the State in production, policies to do with redistribution, policies to do with the role of trade unions. Policies which the establishment will seek to suggest should not even be up for discussion are going to have to be, at least for the next month. You know the right wing press are concerned about this, because instead of properly assessing the policies, they posted pictures of Corbyn’s car running over a BBC cameraman, Len McLusky falling down some steps, and shouted ‘back to the 1970s’ and ‘Marxism’ to describe policies that the social democratic Norwegian Labour Party have been proposing for years, during which they have been in government and Norway has been right up at the top of the Human Development Index and other measurements of standards of living. Ed Miliband’s policy programme was too timid. It tinkered around the edges and left people simply saying that it comes down to who the country wanted as PM, and the country chose David Cameron. Corbyn’s manifesto will hopefully have us discussing policy differences, properly, even for only a little while. I think, in a functioning democracy, a leading party needs to try to move the Overton Window occasionally. J.S.Mill argued that we should never inhibit free speech and the exchange of ideas as it brings us nearer to ‘truth’. So let’s hope we have a proper exchange of ideas over the next month. Although, like Corbyn’s favourite poet, John Lennon, you may say that I’m a dreamer.